Some areas of the country have been designated by the EPA as high status water bodies (HSWs). These areas have very high water quality and measures under GLAS have been designed to maintain this high water status. Farms located within HSW’s are given priority access to GLAS. Beef and dairy farmers must fence water courses on their farms to prevent access by livestock. 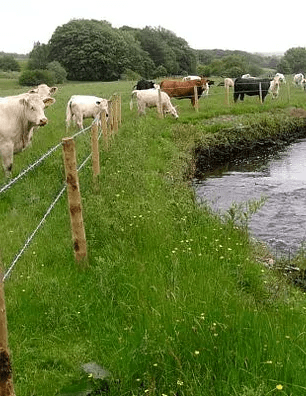 ​Hugh Mooney a beef farmer from Kildare joined GLAS in 2015 “choosing to fence off the water course on my farm increased the likelihood of gaining entry to the scheme”. The payment for fencing of the watercourse is €1.50 per m/year. ​Water courses are extremely important to biodiversity with many habitats and species flourishing both in the water and along the banks of streams. Keeping livestock out is important both to prevent contamination by nutrients, and to allow vegetation to flourish on the banks. All and all, in excess of 12,000 kilometers of water courses have been fenced under the scheme. Click here for more information on the GLAS scheme.